Figure 3.5. Genetic organisation of light chain genes. Figure 3.6. Idiotypic, isotypic and allotypic variation of light chains. Firstly, different combinations of gene segments are used in the rearrangement of heavy and light chain genes during early B-cell development. κ light chains are constructed from one of approximately 40 functional Vκ gene segments, one of 5 Jκ gene segments and a single Cκ gene. λ light chains are constructed from one of approximately 30 Vλ gene segments, and one of four (or more) pairs of functional Jλ gene segments and Cλ genes  (Figure 3.5) . The heavy chain variable region is formed from one of around 60 VH, one of 30 DH, and one of six JH gene segments . This combinational diversity accounts for a substantial amount of variable region diversity. 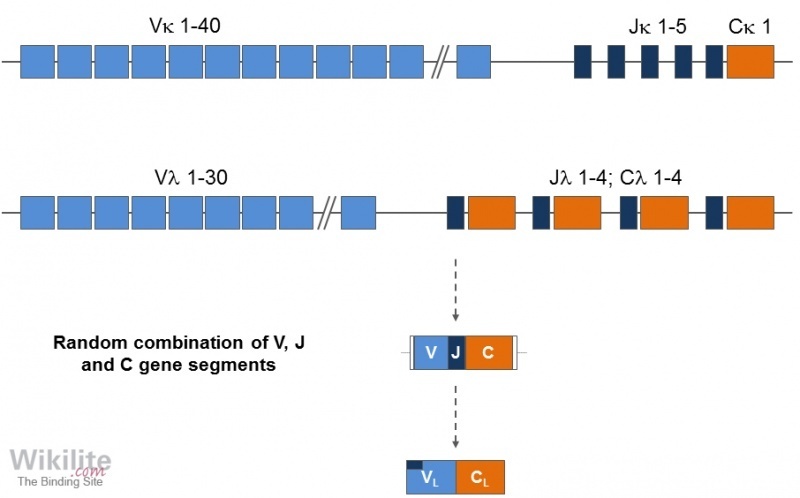 Secondly, diversity arises from the addition or removal of nucleotides at the junctions between V (D) and J gene segments during recombination. A third source of diversity arises from the many different combinations of heavy and light chains, and finally, somatic hypermutation introduces point mutations in the variable region genes of light and heavy chains in mature activated B-cells . In light chains, variations are also found in a region of the variable domain corresponding to the first 23 amino acids of the first framework region (a region not associated with antigen binding). 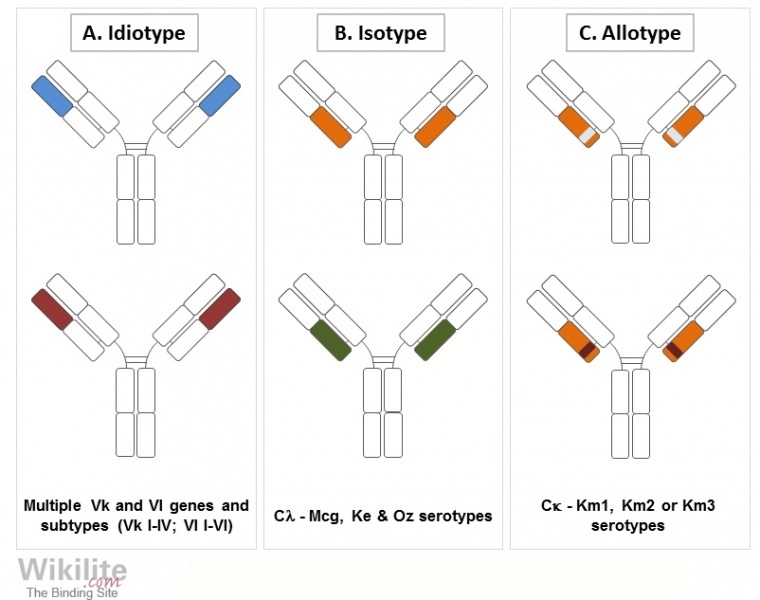 Using monoclonal antibodies, four κ (Vκ I - Vκ IV) and six λ subgroups (Vλ I - Vλ VI) have been identified  (Figure 3.6A). The specific subgroup structures influence the potential of free light chains (FLCs) to polymerise. For example, AL amyloidosis is associated with Vλ VI, and light chain deposition disease (LCDD) with Vκ I and Vκ IV.